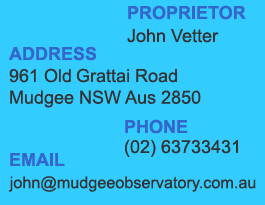 Mudgee Observatory is located just outside the small town of Mudgee in country New South Wales, Australia. (149 deg E, 32 deg S). 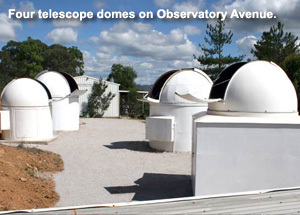 The observatories and buildings were all constructed by John who has over 45 years of astronomy experience. 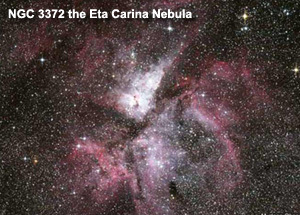 The facilities have been used on occasion by the University of NSW, the staff of Sydney Observatory and members of the Sutherland Astronomical Society. We are now open to the general public and catering for school groups, organized tours and any member of the general public who wishes to attend. The observatory is situated 15 minutes drive to the west of Mudgee in a location of extremely dark skies away from the town lights and the lights of Ulan mines. 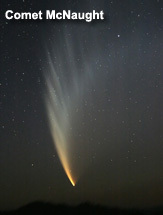 Here the night skies can be viewed as they were meant to be viewed. A visit to Mudgee Observatory can be both entertaining and educational for people of all ages. The theatre and flat screen planetarium runs several features on the night sky and the Sun as well as many programs on space missions. A good variety of telescopes and binoculars are available for our visitors to use as well as conducted tours of the night sky. We also run daytime sessions for viewing the Sun and bookings are essential for both night and day sessions. The observatory shop sells coffee, cold drinks and confectionery as well as books on astronomy and other items.